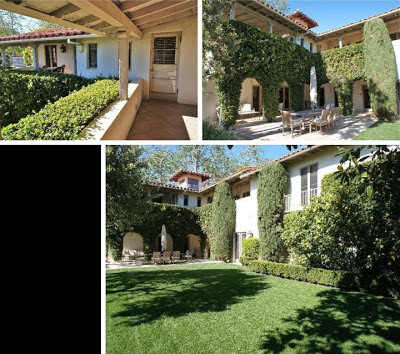 YOUR MAMAS NOTES: Late last week it was revealed by the folks at Zillow that two-time Oscar winning actor Tom Hanks and wife Rita Wilson put one of their many homes in the prosperous Los Angeles community of Pacific Palisades, CA on the market with an asking price of $5,225,000. This isn't, so it would seem, Mister Hanks and Miz Wilson's first time to ride the real estate merry-go-round with this particular Spanish style casa. Your Mama uncovered online evidence the house was actually on the market with little or no fanfare last year (2012) with a higher $5,450,000 asking price. Interestingly, since all the hoopla and hoo-ha about the listing hit the internets over the weekend most but not all online listings for the celeb-owned Spanish have all but disappeared from the interweb. 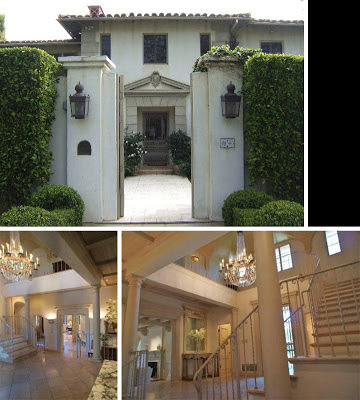 However, thanks to some creative digging and an assist from Our Fairy Godmother in Bel Air Your Mama has managed to locate current and active listing details that show the so-called "legendary villa" was originally built in 1929 on a tight .3 acre lot and has four bedrooms and 5.5 bathrooms in 6,289 square feet. Property records show Mister Hanks acquired the walled, gated, and high-hedged property in Pac Pal's quietly ritzy Riviera 'hood for $1.9 million way back in April 1988, right about the time and Miz Wilson were united in legal matrimony and not long before his first Oscar nominations for Big. A grand and monochromatic beige double-height foyer, lit by a glimmery crystal chandelier, is ringed by a second floor gallery. Strongly pedimented pocket doors lead to a robustly scaled formal living room with nearly white hardwood floors, a white-washed (or maybe it's limed) wood ceiling, a wood-burning fireplace, and a series French doors with semi-circular transoms, some of which open to a loggia that overlooks simply landscaped gardens. Pedimented pocket doors also mark the entrance from the foyer to the formal dining room that has a built-in bookcase/china display cabinet and a coffered wood ceiling. Somewhere in the house, presumably in close proximity to the formal living and dining rooms, there's also a library described in current listing details as "intimate" and "ideal for meditations or reading." 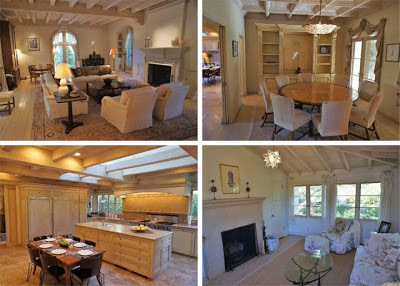 Numerous windows and several large sky lights placed between heavy duty wood beams on the ceiling flood the oppressively all-beige kitchen with natural light. The floors appear to be some sort of stone, possibly Travertine or limestone, and the top quality appliances include a mac-daddy six burner range and side-by-side fridge freezers. A shipping container-sized center island with veggie sink separates the kitchen proper from a roomy informal eating space and sitting area with direct access to the outside. A "pretty, sun-filled" guest suite with newly remodeled bathroom is, as per listing details, well separated from the upper floor family quarters that include four bedrooms plus a "romantic" master suite complete with "stylish" bath and direct access to a meandering covered terrace with over the tree tops ocean view. Curiously, the property does not have a swimming pool but it does have a number of other notable features and amenities that include: lots of archway, columns, and hand-frescoed ceilings; a basement level space converted to what listing details describe as "an incredible closet and storage space;" a private beauty salon—they are regular red carpet walkers, after all; and a window-ringed second floor sun room with fireplace. A guest suite with recently updated bathroom is situated well away from the four upstairs family/guest bedrooms and the master suite includes a fireplace and a "stylish bathroom that opens to a meandering ocean-view terrace. The Tinseltown A-list royals maintain a healthy if not outright hefty portfolio of luxury residences. Way back in 1991 they paid $2.95 million for a modestly sized ocean front home in the coveted guard-gated Colony enclave in Malibu and in 2010 they paid 8-time Oscar nominated movie producer Kathleen Kennedy and five-time Oscar nominated movie producer Frank Marshall just over $26 million for a muscular 14,500+ square foot Gwathmey-Siegel-designed residence on a private promontory in Pacific Palisades. At the same time they bought the Kennedy-Marshall mansion they also forked over another $1,450,000 for an adjacent property with a much smaller 1 bedroom and 1 bathroom house, presumably for staff, family or guests. According to our brief and unscientific research The Hanks-Wilsons also keep a substantial multi-million dollar residence near Sun Valley, ID as well as a down on her heels ranch style residence on a double lot in the Riviera area of Pacific Palisades plus a pair of much more modestly sized side-by-side residences a few short blocks the heart of downtown Pacific Palisades. Agree with Rosco -- ho-hum interior. I am actually a bit disappointed. And 6,000+ square feet on a .30 lot is depressing! I guess they waited until their children were grown until they splashed out on the home of their dreams? "Legendary Villa" = Jack *ss. The Riviera has the best Security Patrol in the Palisades. Great place to live. "This isn't, so it would seem, Mister Hanks and Miz Wilson's first time to ride the real estate merry-go-round with this particular Spanish style casa." Except for the exterior wood detailing on the porches, this house looks a lot more Italian than Spanish to me. No big deal.